An earthquake swarm occurred at the W tip of the island 24-31 August, including a M 5.2 shock at 9 km depth on 24 August (figure 3). A total of 24 earthquakes was detected at Iriomote-jima Weather Station, on the NW coast of the island. Figure 3. Epicenters of earthquakes near Iriomote-jima (filled circles), September-November, 1992. Diagonal lines mark the area of the August 1992 swarm. Courtesy of JMA. A second, more severe swarm began on 17 September, centered a few kilometers N of the island and about 20 km NE of the August swarm. Epicenters migrated towards the island, and by November, the source area encompassed the northern coast. Depths ranged from 0 to 10 km, concentrated at around 5 km. Seismicity gradually declined toward the end of 1992, after a peak in mid-October when 112 earthquakes were recorded on the 14th (figure 4). The swarm's largest shock was M 5.2 on 20 October. A total of 1316 earthquakes occurred from 17 September to 31 December. A network of ten seismometers recorded no volcanic tremors, and no anomalies were observed on the land or sea surface. Figure 4. Daily number of earthquakes at Iriomote-jima, 1 August-31 December 1992. Courtesy of JMA. The most recent seismic activity had occurred in the same area from January-May 1991, when 676 earthquakes were recorded, the largest M 4.3 (16:3-4). The Global Volcanism Program has no Weekly Reports available for Submarine Volcano NNE of Iriomotejima. A swarm of high-frequency earthquakes . . . began 23 January, peaked in February, and continued at high levels through mid-April. The press reported that more than 940 earthquakes had been recorded by 14 April. Epicenters were on the W coast (at shallow depth) where many shocks were felt daily. Tremor episodes were not recorded and surface activity was not observed on the island or the surrounding sea. High levels of seismicity . . . suddenly declined in late April (figure 1). A total of 670 high-frequency earthquakes were felt by the end of April, including nine of JMA intensity IV, and a M 4.3 event on 31 March. The swarm was centered on the NW coast of the island (figure 2) at 0-10 km depth (the majority at ~5 km). No surface phenomena (steaming, bubbling, or water discoloration) were found despite frequent patrolling over the island and adjacent sea area by JMSA aircraft. Figure 1. Daily number of recorded earthquakes at Iriomote-jima island, 23 January-10 May 1991. Solid columns represent felt events. Courtesy of JMA. Figure 2. Epicenter map of earthquakes at Iriomote-jima island, 23 January-10 May 1991. A solid square marks the JMA weather station. Courtesy of JMA. The southernmost Ryukyu Islands volcano is a shallow submarine volcano NNE of Iriomote-jima island. It is located 20 km NNE of Iriomotejima and 35 km WSW of the northern tip of the island of Ishigakishima in an area with an estimated depth of 200-300 m. A major submarine eruption took place on 31 October 1924. It produced rhyolitic pumice rafts with an estimated volume of about 1 km3 that were carried by currents along both coasts of Japan as far north as Hokkaido. The largest pumice blocks exceeded 1 x 2 m in size, and the volume of ejecta places this poorly known eruption among the largest in historical time in Japan. Chen C H, Shen J J-S, 2005. A refined historical record of volcanic eruptions around Taiwan: tectonic implications in the arc-continent collision area. Terrestrial, Atmosph, Oceanic Sci, 16: 331-343. Kato Y, 1982. Position and amount of erupted pumice from the Iriomote submarine volcano, Ryukyu Islands. Ryukyu Is Geol Studies, 6: 41-47. There is no Deformation History data available for Submarine Volcano NNE of Iriomotejima. There is no Emissions History data available for Submarine Volcano NNE of Iriomotejima. 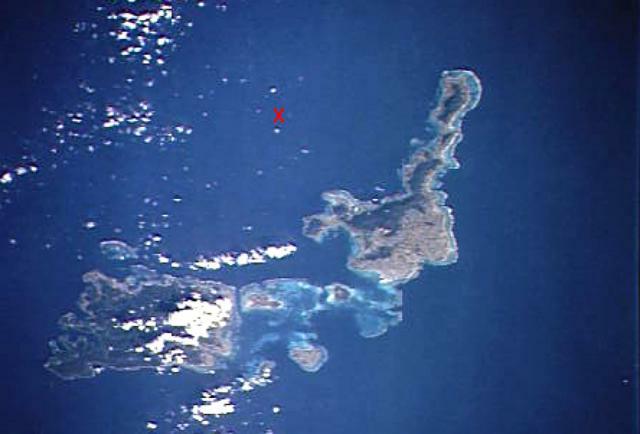 An "X" marks the approximate location of Iriomote-jima submarine volcano, the southernmost Ryukyu Islands volcano. The submarine volcano is located north of the NE tip of 30-km-wide Iriomote-jima island (lower left) and WSW of the northern tip of the island of Ishigaki-shima (right-center). A major submarine eruption that was volumetrically one of the largest in Japan during historical time took place at this volcano on October 31, 1924. It produced pumice rafts that were carried by currents along both coasts of Japan as far north as Hokkaido. NASA Space Shuttle image STS66-117-19, 1994 (http://eol.jsc.nasa.gov/). There are no samples for Submarine Volcano NNE of Iriomotejima in the Smithsonian's NMNH Department of Mineral Sciences Rock and Ore collection. Large Eruptions of Submarine Volcano NNE of Iriomotejima Information about large Quaternary eruptions (VEI >= 4) is cataloged in the Large Magnitude Explosive Volcanic Eruptions (LaMEVE) database of the Volcano Global Risk Identification and Analysis Project (VOGRIPA).